What a year 2018 has been! I signed up for a modest three titles with #AWW this year, because I didn’t think I would have the time for more. In the end I have totted up a whopping fifty-two reviews this year – not bad considering I have also had five novels of my own published! A healthy nine of those reviews were of novels written by Australian women writers. Here are my reflections of the Australian women writers I have read over the last twelve months. I have travelled far and wide through this collection of novels, from Ancient Egypt with L.J.M. Owen to the Scottish highlands with Patricia Leslie. I have dwelt long in Queensland with Slatter and Saftich and western New South Wales with Bendon and Steele. With Nightingale I have entered the fantasy realm of Tarya reminiscent of Medieval Italy. Not quite sure where I landed with Goodin, but it was a thoroughly entertaining place to be. I have journeyed through genres too, from Owen’s captivating cosy mystery to Slatter’s gripping dark urban fantasy; from Nightingale’s charming YA fantasy series to the very upbeat fantasy-comedy of Goodin. A heartrending historical memoir from Saftich and some intriguing contemporary fiction from Steele. A fascinating mystery laced with mysticism from Bendon and a gender-bending gem – part historical, part urban fantasy – from Leslie. All of these novels are top reads and deserve the attention of readers. All these authors demonstrate great care with their prose, and with their plotting and characterisation. A reviewer’s dream! Is there something that defines these women and holds these books together? I believe there is. Australian women writers seem to display a sensitivity and deep consideration of the world around them. These are warm-hearted stories, at times witty, always considered and considerate. My only lament is that all authors need readers, so next time you are after reading something new, pause before you pick up another Rowling or King and take a punt on an author you have never heard of. Dr Elizabeth Pimms, enthusiastic archaeologist and reluctant librarian, has returned to Egypt. Among the treasures of the Cairo museum she spies cryptic symbols in the corner of an ancient papyrus. Curiosity leads Elizabeth and her gang of sleuths to investigate a cache of mummies hidden in the Golden Tomb. What is the connection between the Tomb and Tausret, female Pharaoh and last ruler of Egypt’s Nineteenth Dynasty? How did the mummies end up scattered across the globe? And is Elizabeth’s investigation related to attacks on her family and friends? Between grave robbers, modern cannibals, misinformed historians and jealous Pharaohs, can Dr Pimms solve her new archaeological mystery? Filled with ancient murder, family secrets and really good food, Egyptian Enigma is the third adventure in the charming crime series: Dr Pimms, Intermillennial Sleuth. Really cold cases. woman in her hotel room stealing her journal. fascinating insight into an ancient civilisation. coming into its own as ever it does in the Dr Pimms’ series. I signed up late to the 2017 Australian Women Writer’s challenge. Despite those lost months, I committed to reviewing at least six books by Australian women authors, which is known as the ‘Franklin’ challenge. I ended up reviewing seven titles and I would have written more had I not found myself unexpectedly moving house! What a delightful experience the #AWW has been! I’ve ventured into genres I wouldn’t normally read. I’ve found many absolute gems along the way. Finally, I was treated to Elizabeth Jane Corbett’s The Tides Between “The Tides Between pulls the reader in two directions, the desire to continue turning the pages at odds with an equally a strong wish to pause and reflect on its various intricacies, its depth. The only difficulty faced in reviewing a book of this quality is putting it down long enough to scribe reflections. A work I would describe as literary historical fiction, The Tides Between, is a captivating and immersive read. Set in Canberra, and in the Mayan empire in what is now Guatemala, Mayan Mendacity is the second in L.J.M. Owen’s Dr Pimms, Intermillennial Sleuth series. It is a challenge setting up the next book in a series and Owen has done so with finesse. The narration is light, buoyant, playful at times, yet ever observant, the result, a most satisfying read. The main plot is driven by protagonist Dr Elizabeth Pimm’s new volunteer project, given her by the exacting Dr Marsh. She must assess an archeological find, the remains of a cesnote in Guatemala, meeting a series of crushing deadlines. Elizabeth’s pursuit of answers to the mysteries of the find is continuously thwarted as a number of complications beset her. Obstacles and challenges come from all directions, enough to make the weak among us buckle, but not Dr Pimms. Dr Pimms is supported by a cast of characters, all rounded out and believable. The reader is introduced to each in turn as the story unfolds and a secondary plot emerges, one that is deeply personal. Indeed, it is Dr Pimms’ own history that thwarts her investigation, yet ultimately leads her to mature and open her heart. The story is thoroughly researched; the author clearly knows her themes and her setting. Technical details are provided in an engaging, easy to follow manner. This is especially evident when Owen opens a window on the fascinating world of the Mayan empire, making use of a parallel narrative to take the reader back to the time of Dr Pimms’ find. Elizabeth’s phrenic library is an interesting addition to the narrative, a fascinating invention, one that creates a curious occult dimension to Owen’s series. This phrenic library is a personal and mundane version of the Akashic records, a metaphysical compendium of all that has ever occurred in human history, stored on the inner planes, according to Theosophical belief. As a device, Elizabeth’s inner library works well, granting her plausible, if esoteric, access to knowledge she would otherwise be hard pressed to gain. 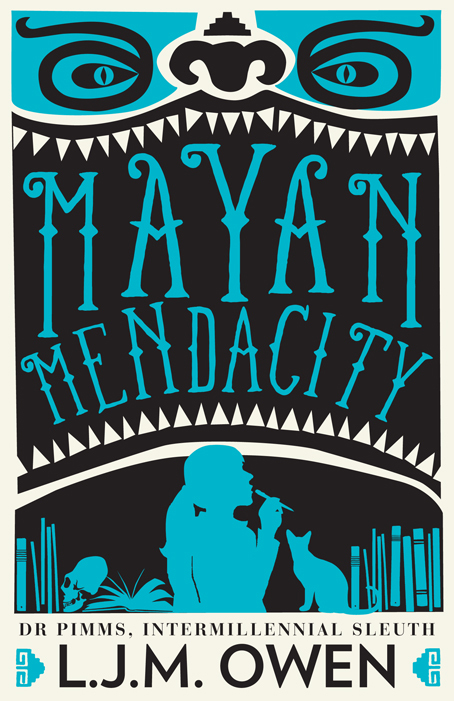 In all, I found Mayan Mendacity difficult to put down. Owen has provided her readers with an entertaining story that also informs, without allowing exposition to put a brake on the narrative. Pulling off a story laden with this much technical detail and maintaining a fast pace is quite a feat.